Before North Shore Star contestant Sean ­Crosley took the stage, he tried to calm his nerves. Even with his theater background, he was intimidated by his first singing competition. Lauren Capron, 16, of Boxford (left); Taylor Callahan, 22, of Marblehead; Whitney Doucet, 22, of Fitchburg; and Danielle Mills, 24, of Beverly waited to sing in the competition. Once he got on stage though, Crosley riffed his way through a jazzy rendition of Stevie ­Wonder’s “Superstition” that had judge Joyce Kulhawik dancing in her seat. Later that night, Crosley was one of three top finalists. The winner of the fifth annual North Shore Star competition, though, was classically-trained Sheree­ Dunwell, who belted out “I Believe in You and Me” by her idol, Whitney Houston. “Whitney would be proud,” Bill Hanney, owner of North Shore Music Theatre, said during the judges’ commentary after the performance at the March 1 competition. Dunwell, who sings in a wedding band, said her competition strategy was simply to perform one of her favorite songs. Fourteen singers performed at the competition, which was hosted by the Beverly Rotary Club and sponsored by North Shore Music Theatre. 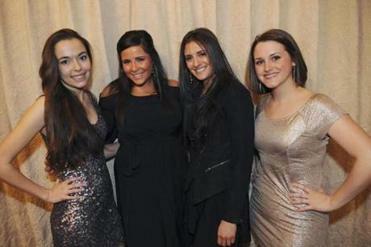 The event drew about 340 people to the ­Danversport Yacht Club in Danvers. Joining Hanney and ­Kulhawik, president of the ­Boston Theater Critics Association, at the judges’ table was longtime radio and television personality Dana Hersey. 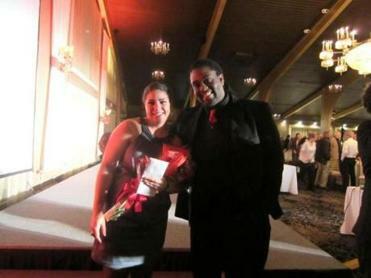 For $75 a person, North Shore Star attendees enjoyed dinner, an auction, and the singing competition. This year, the club raised $28,400 that will benefit North Shore charities. Michael Harrington, chairman of the event and a Beverly Rotary Club member, said each year’s competition raises about $35,000. “Our goal is to raise about $100,000 a year for charity, and we’re always trying to think of fun, creative ways to do it,” he said. Auditions were held in January for the show. From about 70 hopeful performers, the highest turnout at an audition, North Shore Music Theatre representatives selected the singers to compete in the finals for the $1,000 cash prize and a crystal trophy. Harrington, a former member of the North Shore Music Theatre board of directors, said compiling the list of 14 finalists was a challenge. He said audition judges sought diversity among the singers, as well as in their music styles. This winner, Sheree Dunwell, with last year’s victor, Fred VanNess, after the contest at the Danversport Yacht Club. And the contestants tried various methods to stand out before the judges. Despite the contestants’ best efforts, there could only be one winner. Kulhawik, an Emmy-winning arts critic, said Dunwell’s ­fusion of opera training and soul music made an impression on her. Dunwell said that she is thrilled with her win and that she will probably assign a portion of the cash prize to her ­Boston Marathon charity contribution. “I am shocked, excited, really happy, but mostly shocked,” she said.